Your participation in our 2018 Business & Community Guide keeps your business connected and engaged with more than 5,000 readers. New this year, we’ll provide daily access throughout the entire year on recordherald.com. Members of the Carlisle Area Chamber of Commerce provide the highest quality of service and products to customers and to each other. This guide will help strengthen your visibility and promote shopping in Carlisle and Warren County. Produced in cooperation with the Chamber, the guide gives customers a handy reference as they make buying decisions. It’s also a resource for information about our quality of life, including the city, county, schools, trails, and other activities that making living and doing business in Carlisle and the school district so attractive. 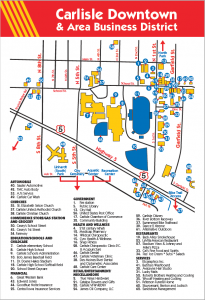 Your business is distributed in 5,500 Business & Community Guides, which are delivered to residents in Carlisle, Hartford, and the Des Moines Easter Lake area within the Carlisle Community School District in both Indianola Record-Herald and Des Moines South Register. 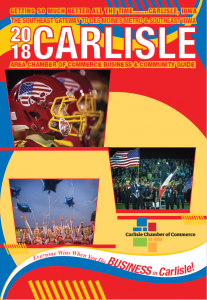 In addition, the Carlisle Area Chamber of Commerce will distribute the publication through the Chamber’s Welcome Packs, local businesses and local events. If you don’t feel that is enough distribution for your business then consider digitized print ads on desmoinesregister.com Business Directory, which link back to your website, enhancing your online visibility and improving your organic search rankings across all platforms. Get your spot in the 2018 Business & Community Guide today! Hurry! The deadline is March 5, 2018. CLICK HERE to see our full page ad for more details and pricing! Remember you must be a chamber member in good membership standing to be in the Business & Community Guide book. Not a member? CLICK HERE See our Memberships page today and sign up! FOR MORE INFORMATION, PLEASE CONTACT THE CARLISLE CHAMBER TODAY!